The CFD650SS is a 60cm freestanding double cavity cooker with electric ovens and gas hob, giving you flexible cooking styles. CFD650SS - CDA. 60cm FREE STANDING DUAL FUEL COOKER. Gril pan with grid : 1. Rangemaster Kitchener 110 duel fuel range cooker and extractor fan. All Rangemaster range cookers have Steadfast™ pan supports as standard. Eliminating wobble and potential spills, Steadfast™ is only available on Rangemaster. Condition is Used. Collection in person only. Rangemaster Elan 110 Black With Hood. Rangemaster Elan 110 Black/chrome Dual Fuel Cooker with Extractor Hood. Dual Fuel. Elan 110 Black/chrome. Excellent condition. No dents or scratches whatsoever. spotless clean inside/out. Wok Burner , Griddle Plate User Guide. Fully Working. Happy Bidding. 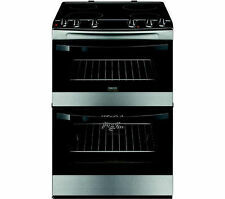 Britannia Dual Fuel Range Cooker - Black / Stainless Steel. 2 Ovens, 3 Grills and 6 Gas Rings. 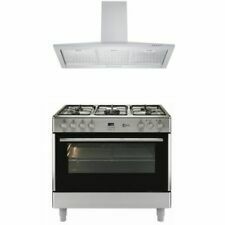 BRITANNIA 90CM MULTIFUNCTION RANGE COOKER ... THIS COOKER HAS BEEN PROFESSIONALLY STEAM CLEANED AND SERVICED TO THE HIGHEST STANDARDS.. FULL WORKING ORDER.. Hob - GAS ( NATURAL ) GRILL-- ELECTRIC OVEN -- ELECTRIC FAN ASSISTED TALL OVEN --- ELECTRIC WARMING PLATE WARRANTY.. INCLUDING 6 MONTHS PARTS WARRANTY.. £60 FOR DELIVERY.. Premium Delivery Service - within 200 miles We provide a premium 2 person delivery service and will happily take the cooker into your home. This applys to England / Wales only. THANK YOU..
TypeFreestanding dual fuel range cooker. Oven typeElectric. Oven typeFan. Main oven shelves- 2 shelves. Pan supportsCast iron. FuelDual fuel. THEY ONLY DROP ITEM TO DOOR NOT INSIDE. Number of burners5. MAIN OVEN - BOTTOM LEFT. Oven capacity: gross - 68 litres, net 61 litres. Halogen oven light. AUXILIARY OVEN – RIGHT. Oven capacity: gross – 69 litres, 62 litres. Oven capacity: gross – 41 litres, 35 litres. 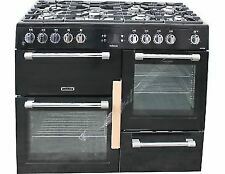 Rangemaster Elan 110 Black Excellent condition 110cm Wide. Fully working. Wok Burner, Manual and Griddle Plate. Fully Working. please check my other listing for matching Rangemaster American style fridge/freezer. Happy Bidding. Hob type Gas. 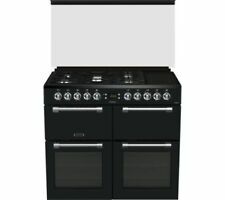 Technical specifications for NEW WORLD 601DFDOL 60 cm Dual Fuel Cooker - Black. Type Freestanding dual fuel cooker. Hob lid Yes. 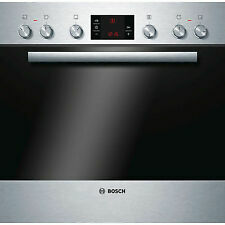 M & S (U.K.) appliance & Electrical Clearance Centre. Box contents - New World 601DFDOL 60 cm Dual Fuel Cooker. TypeFreestanding dual fuel range cooker. Main oven cleaning: Catalytic liners. Oven type- Main: electric. Oven type- Main: fan. Pan supportsCast iron. Oven cleaning- Main: catalytic. 7-burner gas hob / wok burner.